West Valley City, Utah - The Utah Grizzlies are taking on the Rapid City Rush 6 times over the next 2 weeks with the first 3 of those games coming this Wednesday, Friday and Saturday at Rapid City. Face-off all 3 nights is at 7:00 pm. Grizzlies won a thrilling overtime game 4-3 on March 2nd against the Maine Mariners. Will Smith scored his 2nd goal in 4 games for Utah and Joe Cannata stopped 32 of 35 shots. Cole Ully and Caleb Herbert each had 1 goal and 1 assist for Utah and Taylor Richart had 2 assists. Josh Dickinson got the game winning goal for the Grizzlies in Saturday night against Maine. Dickinson's game winner in overtime was the first one since Gage Ausmus won it for Utah on February 15th vs KC, which coincidentally was the last time the Grizzlies had won a game. It was the 4th time the Grizzlies won a game in overtime this season. Caleb Herbert and Jack Walker each previously won the game in extra time. Cole Ully returned to the lineup last Wednesday for the first time since December 29th and he announced his presence with authority as he scored 1:07 into his first game back with a power play goal. Ully scored a goal in each of the 3 games last week. 2 of those goals were on the power play. Ully has 13 goals and 25 assists in 29 games for the Grizzlies. Caleb Herbert had a good week for the Grizzlies. He scored a goal on Friday and Saturday night. Herbert is 3rd in the league with 29 goals and is tied for 2nd with 61 points. Both of Herbert's goals last week came on the power play. Special teams played a big role for the Grizzlies last week, as they finished with a 1-1-1 record vs Maine, who looks like a good hockey club. Utah was 4 for 20 on the power play last week. The penalty kill was a perfect 23 for 23 vs Maine. In fact, the Grizzlies are 30 for 30 on the penalty kill the last 5 games. Grizzlies acquired defenseman Gabriel Verpaelst from the Wichita Thunder for defenseman Nolan De Jong. Verpaelst played in 14 regular season and 4 playoff games for the Grizzlies in the 2016-17 season. Verpaelst has championship experience as he was a member of the 2018 Kelly Cup Champion Colorado Eagles. He scored the biggest goal of the year as he got the game winning goal in game 7 of the finals vs Florida with under 3 minutes left in regulation. He's got quite a slapshot and displayed it with the Grizzlies 2 years ago as he won the hardest shot competition at the Grizzlies 2017 skills competition. The Grizzlies will return to Maverik Center for games on March 14th, 16th and 18th against Rapid City. The 2 teams have become quite the rivals over the last few seasons. Utah has a record of 4-3-0-1 vs the Rush this season. The next 2 weeks are big games for both teams. Utah is just 3 points behind Tulsa for first place in the Mountain Division and 1 point behind Idaho for second place. Rapid City is 10 points behind Kansas City for 4th place in the division and need some wins to stay in the playoff hunt. Last 10 games: Utah is 3-5-0-2. Goals per game: 3.40 (8th in league). Goals against per game: 2.98 (tied 8th). Shots against per game: 28.98 (4th). Power play: 21.9 % (3rd). Penalty Kill: 86.3 % (3rd). 2nd Period Scoring: Utah 73 Opponents 56. Cole Ully has a goal in 3 straight games after being out since December 29th due to injury. Ully had 3 goals and 2 assists last week vs Maine. Caleb Herbert is 3rd in the league with 29 goals and is also tied for 2nd in the league with 61 points. Herbert is 4th in the league with 22 power play points. Josh Dickinson got the game winning goal 21 seconds into overtime to end a 7 game losing streak. Teigan Zahn leads all defenseman with 181 PIM. Wednesday, February 27, 2019 - Maine Mariners at Utah Grizzlies - Maine Wins 4-1. Cole Ully scores a power play goal in his first game since Dec. 29. Joe Cannata stopped 24 of 28 shots. Friday, March 1, 2019 - Maine Mariners at Utah Grizzlies- Maine Wins 4-3 in a shootout. Cole Ully and Caleb Herbert 1 goal 1 assist each. Josh Dickinson shorthanded goal to tie the game in the 3rd period. Eric Freschi 2 assists. Utah was a perfect 12 for 12 on the penalty kill. 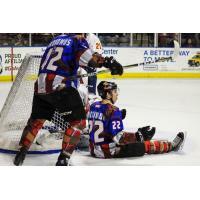 Friday, March 2, 2019 - Maine Mariners at Utah Grizzlies - Utah Wins 4-3 in Overtime. Josh Dickinson OT GWG 21 seconds into the extra session. Cole Ully and Caleb Herbert 1 goal 1 assist each. Taylor Richart 2 assists. Utah 2 for 7 on the power play and 6 for 6 on the penalty kill. Wednesday, March 6, 2019 - Utah at Rapid City 7:00 pm - ESPN 700. Friday, March 8, 2019 - Utah at Rapid City 7:00 pm - TBD. Saturday, March 9, 2019 - Utah at Rapid City 7:00 pm - Classic Country 1370, 104.3 FM/HD-2. Dickinson had a good month of February as he had 2 goals and 10 assists in 12 games and is a candidate for ECHL Rookie of the Month. Dickinson off to a good start to March as he had a short-handed goal to tie up the game in the third period on March 1st and had the game winning goal in overtime on March 2nd.